A career diplomat who served as the U.S. government’s highest ranking representative in Cuba has received the 2017-18 Rotary Alumni Global Service Award. John Caulfield served as a diplomat for more than 40 years, in nine countries on four continents, fostering international understanding and the protection of human rights. He has displayed a life-long commitment to community development, education, disease prevention, and other causes that Rotary also pursues. RI President Ian H.S. Riseley, left, and RI Trustee Chair Paul Netzel, right, present John Caulfield, a career diplomat, with the 2017-18 Rotary Alumni Global Service Award Tuesday at Rotary’s Convention in Toronto. As a 1973-74 Ambassadorial Scholar sponsored by the Rotary Club of Moorestown, New Jersey, USA, Caulfield studied at the Universidade Católica do Salvador in Brazil. During his studies, he attended Rotary club meetings and began to consider a career in diplomacy, as learning Portuguese exposed him to a new culture. 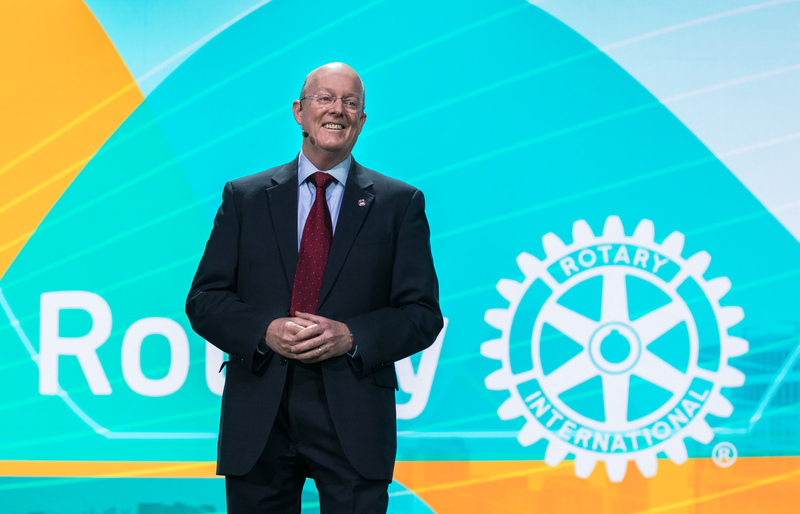 “When we participate in an experience such as a Rotary fellowship, we end up learning as much about ourselves, and our own countries, as we do about our hosts,” Caulfield said in his acceptance remarks Tuesday at Rotary’s Convention in Toronto. “After being an unofficial representative of my country abroad," he said, "it occurred to me that I would enjoy being an official representative." The Rotary Alumni Global Service Award celebrates alumni whose service activities and professional achievements exemplify the Rotary ideal of Service Above Self. The award was first presented in 1995 and has honored policymakers, ambassadors, educators, and humanitarians. Caulfield’s assignments repeatedly placed him where diplomatic relations were tense. As chief of the United States Interests Section in Havana, he negotiated agreements on immigration, environmental protection, and cultural affairs that prepared the two countries for the re-establishment of diplomatic relations in 2014. Before that, in 2008, as deputy chief of mission in Caracas, Venezuela, he took charge after then-President Hugo Chavez expelled the U.S. ambassador. Caulfield guided the embassy through a tense period, maintaining communications with governments, factions opposed to the government, and businesses. As consul general in London, England, in 2005, he supervised services for the world’s largest American expatriate community, as well as overseeing U.S. visa services. As deputy chief of mission at the U.S. Embassy in Peru in 2002, he supported Peru’s return to democracy and economic growth after years of terrorism. He led the embassy for a year after the unexpected death of the ambassador. Caulfield has received many other awards during his career, including a Presidential Meritorious Service Award, the U.S. Department of State’s Distinguished Service Award, and the Secretary of State’s Award for Innovation in the Use of Technology. Caulfield also supports Carmen & Rey’s Kids, a private organization in Cuba that assists children with cancer. Recently retired, Caulfield is now a frequent speaker at conferences, universities, and civic clubs. He also consults with companies that seek to expand into the Cuban market. Caulfield said that interviewing thousands of people traveling to the United States early in his career helped him learn about the economies of the countries where he was assigned. He learned that it’s important for small businesses to broaden their perspectives and understand how they can participate in the world market. “Throughout the world, I have seen firsthand how Rotarians support each other in business, and support their communities,” he said. Caulfield said Rotary has a strong presence in all the countries he was assigned to except the most recent, Cuba. But the country is changing quickly, and he sees possibilities expanding there. “My hope, and expectation, is that within a few years, there will be an opportunity to re-establish Rotary in Cuba,” he said.